All four of the actors in this production are new to the HTC stage, but they are veteran performers who bring great chops to their roles. They all shine under the direction of HTC’s executive director, Sarah Hunnewell. Sandy York, appearing courtesy of Actors’ Equity Association, plays Sarah Goodwin like one would play a human who thinks she is a camera. She sees everything clearly and emotionlessly, with a surgical precision. Every twitch of her lip says volumes about her disdain for a world that has seen so little, first-hand, of what she has seen. She’s as much of a hard case as her Leica. She could lose a world’s worth of love and not care. When Mandy and Richard open up Sarah’s laptop to look at the photographs of her last trip to Iraq, Mandy unselfconsciously blurts out that one is beautiful, then realizes the absurdity of calling a war photo beautiful. This production is beautiful in much the same way. 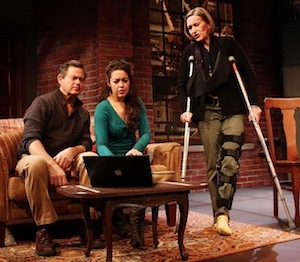 “Time Stands Still” runs at the Quogue Community Hall from Jan. 8 through 25, with shows on Thursdays and Fridays at 7 p.m., Saturdays at 8 p.m. and Sundays at 2:30 p.m.